Nintendo Co., Ltd., originally a playing card company, began making TV gaming systems in the 1970s, updating Pong and having mild success with its so-called TV Game systems; however, it was the Family Computer that set Nintendo’s profits on fire and propelled Nintendo to the top of a video game empire that continues today. 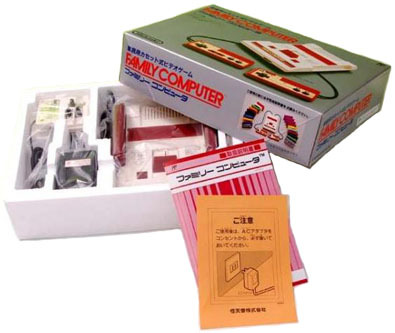 Nintendo released the brilliant white and red Family Computer, or Famicom for short, in Japan in July 1983, after the failure of Atari in the early ’80s. Up until the 1980s, children were playing classics such as Donkey Kong in the arcades and on Atari consoles, but wanted something new and more diverse. Nintendo developed the Famicom “by keeping in mind that both the custom CPU (central processing unit) and the PPU (picture processing unit) would facilitate the realization of what game developers had in their minds,” said Hiroshi Yamauchi, a Nintendo executive, in an article in the Tokyo Metropolitan Museum of Photography Family Computer commemoration book. So, after some re-tooling of the guiding principles for arcades and Atari, Nintendo sent forth into living rooms around the world the Famicom, in Japan, and its brother console, the Nintendo Entertainment System (NES), released to the rest of the developed world. 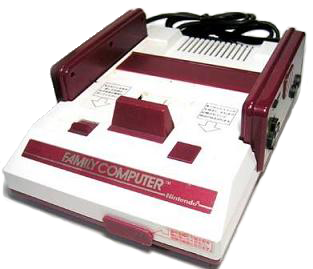 The Famicom, with its glistening red and white plastic body, comes with two controllers, fixed on both sides of the console by short black cords, which forced young gamers to sit closer to their TV screens when playing. The second of the two controllers was given a microphone function, which could be used in some games, including for karaoke, or could be used just to irritate your friends by talking through the TV speakers. The controllers were designed with Nintendo’s Game & Watches in mind. The Famicom had a large red knob used to slide the games out of the pins slot. It had the standard On/Off button and a Reset button. A port at the front of the console allowed for accessories, such as controllers, a 3D system and handheld microphone, to be connected. 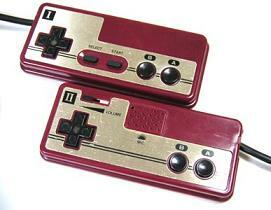 Accessories were introduced throughout the Famicom’s decade, enhancing gameplay like never before. The Famicom was a hot item from the day it was released, though the first release of the Famicom, known as the square-buttoned Famicom, had problems that irked early gamers, including soft rubber A and B buttons that could quickly wear down. 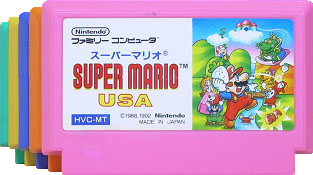 Famicom games were written to chips on a board that came in small plastic cartridges gamers would insert into the top of the Famicom, similar to the top-loading NES. The cartridges came in various colors with often great label art. The cartridges varied in size and shape, but were never made as large as NES cartridges. The games themselves are memorable. “Family Computer games were easy to understand and that gave them the advantage of gaining popularity among different generations, which brought about the birth of various game genres,” Yamauchi said. The Famicom’s most famous game is Super Mario Bros. for its sheer innovation, but many gamers, young and old, still have their own personal favorites. Like with the NES, Famicom cartridges became a problem. Some games would freeze up during gameplay or not play at all due to dust and grime that got in between the contacts on the cartridge and the console. Though cleaning was encouraged, the cartridges were very small and often difficult to open. Because the Famicom never came with a lock-out chip, like versions of the NES that kept unlicensed and pirated cartridges from being played, pirated cartridges abounded in Asia. Just about everywhere you turn today you can get pirates of 8-bit games and sometimes even 16-bit games (reduced to 8-bit quality). Strangely enough, even though gaming had moved well beyond the 8-bit era, some companies continued to make pirates into the turn of the century. The Famicom originally retailed for 14,800yen (about $120 in today’s dollars) and sold nearly 19.4 million units. “Looking back,” said Yamauchi, “the success of the Family Computer was due to the praise of the users around the world, and Super Mario Bros., released in 1985, which played a big role in the dissemination of the hardware, for it provided a kind of entertainment that touched the hearts of the Japanese, Americans and Europeans.” Nintendo stopped producing the Famicom in September 2003 because secondary companies were no longer manufacturing the parts Nintendo needed.